While studying for her BFA at the University of Connecticut, M.J. discovered Ms. Mollie Hubbard in the biology Scientific Illustration Office. This chance encounter opened up a world of possibilities to use her skills as an artist to illustrate the complexities of science. Upon graduation, M.J. worked as an illustrator for some 70 scientists, illustrating a broad and deep array of biological subjects for publication in books & scholarly journals. M.J. Brush became a member of the Guild of Natural Science Illustrators in 1974. (GNSI.ORG) She served as Vice President of the Guild from 1990 to 1994. M.J. was awarded the Guild’s Distinguished Service Award in 2001, the same year she helped start a New England chapter of the Guild. Over the years, she has taught science illustration in the honors program at “UConn”. 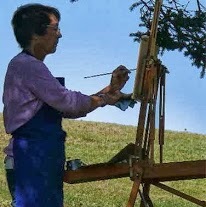 She also taught watercolor workshops at the Mystic Art Association as well as private workshops in the area. After retiring from the University in 2000, she & her husband, Dr. Alan Brush, sailed their 33’ Cape Dory the length of the Eastern U.S., while working on a book describing the ecology of the coast & changes to the habitat over the past 300 years. (He was the writer & she the illustrator.) Their book was published in 2018 by the Catesby Trust & can be ordered on-line from catesbytrust.org. M.J. lives in Stonington, CT & paints the sea, the illumination of light, nature, still life, landscapes & the flora/fauna that surrounds her.